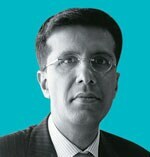 ABOUT: Many in the Indian financial fraternity rank Ashish Dhawan as among India's three most successful private equity fund managers of the last decade or so. An investment professional since 1992, the Yale-Harvard alum shifted gears in 2012, moving to a passion dating back more than two decades: education. At Central Square Foundation, which he founded and runs as CEO, he hopes to help transform standards of education in India. India has been among the fastest-growing economies in the world in the last decade. However, low-quality education is crippling India's growth as its emerging workforce is unable to cope with the demands of a 21st-century economy. 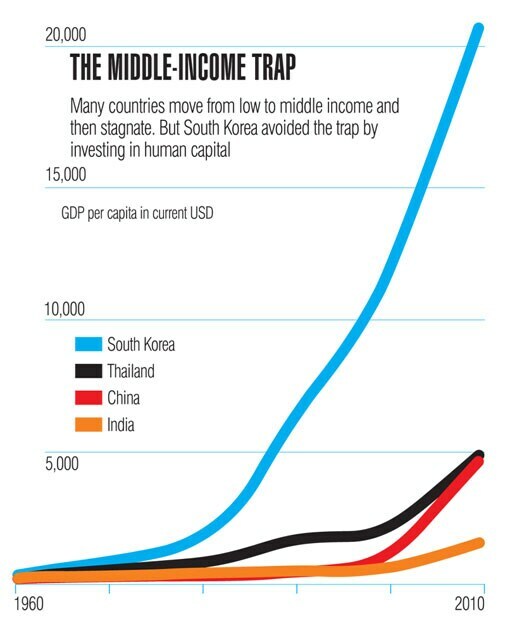 Countries like Thailand and Mexico that did not invest in education have struggled to maintain their growth, whereas a country like South Korea invested in quality of education to transition into an innovative economy. India too will get trapped in 'middle-income', if we do not act with urgency now to transform the quality of education delivered in our country. Traditionally, our efforts around education have focused on enrolment and not on children's learning. It is hardly surprising then that despite 97 per cent enrolment in Class 1, only 35 per cent reach Class 12 and less than 20 per cent enroll into higher education. Even for those who do complete graduation it doesn't really get any better - nearly half of our graduates are unemployable in any sector. In the hope of reaping India's demographic dividend, our governments have prioritised skill development. The UPA government established the National Skill Development Corporation in 2008, with the target of skilling 500 million youth by 2022. The new government is developing a 'Skill India' scheme, which is expected to be launched in March 2015 and move beyond the UPA's target. While we emphasise skilling, it is critical to understand that skilling is about 'repair' and will at best give us some short-term results. To unlock the true potential of our human capital, we must transform our school and higher education system to prepare our students for life and the workplace. >> Accountability to student learning and reforms in governance: Just as the success of a business cannot be determined by the amount of raw material consumed or the strength of its infrastructure, the success of an education system must not be determined by inputs such as the number of classrooms, the number of books in the library or pupil-teacher ratios. We must hold our education system accountable to high standards of student achievement. 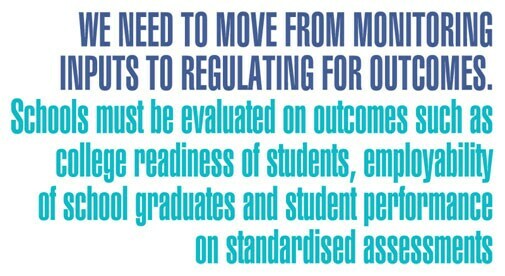 For this, we need to move from monitoring inputs to regulating for outcomes. Schools must be evaluated on outcomes such as college readiness of students, employability of school graduates and student performance on standardised assessments. Higher education institutes, similarly, must be evaluated based on measures such as student selectivity, placements, research papers published/cited in premier academic publications, etc. We also need to ensure robust accreditation mechanisms for all higher education institutes. Third-party agencies such as the National Assessment and Accreditation Council, as suggested by the government, can hold institutes accountable to delivery of quality education. Additionally, the government should incentivise high-performing institutes, while phasing out poor- performing ones. Our accreditation must shift focus from inputs and processes, and adopt an outcome-focused approach for quality assurance. Whilst the rankings generated by media publications may not be rigorous, they do survey students and peers, and pay attention to the placement track record. >> Investment in human capital development: For our children to receive best-quality education, it is imperative we attract the best and the brightest into the teaching profession. We must have a high bar for entry into the profession, with top-quality institutes for developing their capacities. It is essential to professionalise teaching, such that multiple career tracks and avenues for growth (e.g. subject matter experts, curriculum developers, teacher educators, principals/ heads of institutions) are available to our teachers. Great leaders make great institutions. Imagine a system where the senior most employee in an organisation is made the CEO. Today, unfortunately, our government school system appoints principals based primarily on seniority. We need a process for selecting our school principals and heads of institutions based on merit. Further, we need to invest in equipping these institution heads with skills that can enable them to move beyond administrative functions and assume larger leadership roles. >> Technology for personalised learning and quality at scale: Technology has the potential to create new models of learning and achieve impact at scale. We must invest in a strong technology backbone, focusing on hardware and software development across our school and higher education institutions. Educators must be trained to integrate technology in their pedagogy for effective classroom delivery. Developing high-quality Massive Online Open Courses (MOOCs) and personalised learning resources in local languages can go a long way in balancing the tension between equity and excellence at scale. Blended MOOC platforms such as SWAYAM (Study Webs of Active-Learning for Young Aspiring Minds), which was recently announced by the government and is being developed by IIT-Bombay, could deliver high-quality training to teachers at scale. >> Integration between various stages of the education system: We cannot expect a business to deliver the best results if every step in the operational cycle is not properly linked to the next step. Adequate resource investment during each step of the cycle is critical for a business to achieve its goal. Similarly, we cannot expect our citizens to realise their full potential if we don't invest in every phase of their education journey. We must start by recognising that early childhood education lays a strong foundation and ensure that every child receives it as part of the formal schooling system. As we move to primary education, we should focus on strengthening every child's literacy and numeracy skills. Secondary education should focus on enhancing employability and college readiness through vocational education, college preparation and career counseling. Eventually, as an individual pursues higher education, we should ensure she receives 21st-century skills such as writing, communication, critical thinking and collaboration, which will make her an informed and productive citizen. A high-quality education system is a pre-requisite for our country to achieve global excellence. For addressing India's education crisis, we require resolute political leadership with a clear vision for education that is able to unite the forces of government, corporate houses and civil society organisations towards building the nation of our dreams.